The CEA (Construction Equipment Association) is once again hosting a UK Pavilion at the forthcoming Bauma Munich construction machinery, vehicles and equipment exhibition, which is taking place in Munich Germany 8 – 14 April this year. The dedicated UK Pavilion (Hall B5) will feature an impressive 34 exhibitors (in addition to the CEA booth), comprising construction companies and industry suppliers from the UK. Bauma Munich 2016 attracted nearly 583,736 visitors from 219 countries and regions, as well as 3,425 exhibitors from 58 countries. The show occupied 605,000 m² of exhibition space. According to Bauma Munich, 73 percent of trade visitors are decision-makers, and 23% are key decision-makers who are looking specifically for new solutions: CEOs, managers, investors and buyers from around the world – making the show an excellent prospect for UK exhibitors to get in front of potential new customers and ‘fly the flag’ for Great Britain. UK exhibitors that have committed to exhibit at an overseas event at with the CEA for the first time include TuffTrak, EMJ Plastics, Halco Rock Tools, IHS pumps and Veethree (formerly CANtronik). First time exhibitor, EMJ Plastics is a leading provider of GRP permanent formwork for the construction of composite concrete decks. Primarily used as bridge beam formwork the company can adapt the size and shape of its formwork to suit other cast in situ civil structures. Also new is Halco Rock Tools, who is a manufacturer of ‘Down the Hole’ drilling equipment for Blasthole, Waterwell, Geotechnical and Oil & Gas applications. IHS pumps will also be making its show debut at bauma in the UK Pavilion, the company manufactures, what it claims to be, unique All-in-One hydraulic vehicles to mix, pump and deliver concrete/beton on site from a single vehicle. The IHS Pumps hydraulic machine employs an on-board computer, electronically weighing every ingredient and producing a printed ticket for every batch. IHS says that this provides a level of consistency and quality far beyond the capabilities of standard volumetric mixers and delivers the most accurate strength of mix in the sector today. Gary Lansley, sales director, IHS Pumps said, “Bauma offers an unrivalled opportunity to meet with peers, suppliers, and potential clients from throughout the construction and manufacturing industries. Especially in the shadow of Brexit, it’s important for us as a leading UK producer to get out there and demonstrate that Britain is still an outward looking, international-trade orientated country and that our manufacturing is still amongst some of the best in the world. First time exhibitor TuffTrak is a market leader in temporary access mats and ground protection solutions. The company provides high quality ground protection and turf protection for oil and gas, transmission and distribution, construction, renewable energy, outdoor natural grass, outdoor synthetic field, and indoor synthetic field stadium and event applications. Michael Mundell-Poole, marketing manager, Tufftrak said, “TuffTrak is pleased to be exhibiting at Bauma 2019. With the help and support provided by the Construction Equipment Association, we will be bringing a wealth of experience gained from the UK within the construction and groundworks industries to the wider audience of visitors attending this year’s event. Veethree (formerly CANtronik) manufacture CANbus HMI displays and gauges supplying to OEMs worldwide – the company is also making its debut at bauma Munich. Having changed ownership in 2017 CANtronik became part of the Veethree Group with companies operating out of the USA & India and combined over 900 employees worldwide. CANtronik will be unveiling the new group global branding at Bauma exhibiting for the first time as Veethree. The rebrand, which is currently in progress, brings together the group companies providing a cohesive image to our global customers going forward. James Cope, sales and marketing manager, Veethree, commented on the company’s debut at Bauma, he said, “CANtronik are excited to be at Bauma for the first time in its 12-year history, having grown from a Marine pedigree our CAN bus displays have seen increasing uptake in Construction industries by OEMs seeking ‘ruggedised’ IP rated and highly configurable HMI displays. Visitors to the CEA’s UK Pavilion will also see Amber Valley Developments who is showing for the first time the company’s latest patented product – Alarmalight – which the company claim is the ‘ultimate’ SPEECH alarm with light combined warning system. Ashtree Vision and Safety has recently added a range of beacons, work lights, reverse alarms, DIN connectors and LED mini light bars to the product range which will be on the company’s stand at bauma. ATP Industries Group is the UK’S only official Dealer for ZF Off Highway and a supplier of transmission parts for construction machinery such as backhoe loaders, telescopic handlers, forklifts and airport ground support equipment. The company also specialise in gearbox charge pumps torque converters and transmission plate coolers all parts are supplied to OEM quality. British Steel is also exhibiting and can offer tailored solutions for earthmoving and excavation applications. The company’s profile range includes hot-rolled track shoes to optimise customers manufacturing processes and cutting edges for wear-resistance and extended life for bucket edges and blades. Scottish manufacturer Caldervale Group Ltd will be showing its range of hydraulic breaker steels. The company also offer a bespoke service. Plantworx Construction Exhibition (11-13 June 2019 East of England Arena Peterborough), hosted by the CEA, is also taking a stand in the UK Pavilion. Visitors to the stand can find out all about the new initiatives taking place at the UK’s largest working construction equipment show in 2019, which include a state-of-the-art simulation zone, a drone zone, a careers zone and a working classic plant display. These new areas of the show will sit alongside the very latest in machines and technology from leading OEM’s and suppliers. CESAR Datatag ID will be demonstrating to exhibitors the official British Construction & Agricultural Equipment Security and Registration (CESAR) scheme, which is promoted by the Construction Equipment Association (CEA) and supported by the Agricultural Engineers Association (AEA). Powered by Datatag technology, accredited and supported by Thatcham and Secured by Design, CESAR has contributed to a 70% reduction in equipment theft in the UK. C.E. Niehoff & Co, a privately held American company, will be showing its range of heavy-duty brushless alternators. Con Mech Engineers manufacture and supply Ground Engaging Tools in the form of cutting edges and wear parts for the mining and construction industry. The company manufacture for OEM’s and at Bauma will be showing its ‘own’ branded “Blademaster” range. Fablink is using Bauma to show its products which range from complex sheet metal pressings and assemblies through to more complex products such as cabs, tanks, structural components and chassis. Customers in the Construction sector include CAT, JCB, Mecalac, Perkins, Terex and Volvo. Volume of production ranges from one-off through to 50,000+ per annum. Friction Marketing Company is a specialist manufacturer predominantly involved in the field of “wet” friction materials, its products, which include sintered metallic, advanced friction paper, carbon, molybdenum, graphite and steel counter plates, will be on display at Bauma. The products are used in a wide variety of heavy-duty transmissions, clutch, differential and brake applications. A regular overseas exhibitor, Gate 7, will be promoting its range of vehicle branding, safety, warning and instructional decals to the Construction Equipment, Agricultural and Industrial Market. Gate 7 supply many leading OEM’s including JCB, Komatsu, Caterpillar and Volvo. Giant Crushing will be promoting its extensive range of crushing, screening and asphalt plant wear and spare parts, which suit all major manufacturers, ranging from full jawstock assemblies, head and shaft assemblies, to full asphalt plant refurbishment. GKD Technologies, is another CEA member company that exhibit world-wide, at Bauma the company will be showing its range of safety enhancing electronic monitoring systems developed for machines and people. GKD’s SensorSafe products monitor and control excavators to restrict movement within safe parameters. Perfect for working in enclosed spaces and next to open carriageways. GKD’s SensorZone products use RFID technology to reduce the risk of vehicle-personnel collisions. 360-degree zones are created around vehicles which, when breached by a personnel tag, alerts the operator and pedestrian to be aware of the hazard. 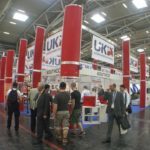 Industrial Clutch Parts for Bauma 2019 Industrial Clutch Parts will display a new range of Sintered and Paper lined friction discs for industrial and off highway transmissions. Kay-Dee Engineering Plastics will be showing the company’s Kaylan high performance polyurethane elastomers which the company say are a unique range of formulated plastics whose outstanding physical properties provide the ideal solution to a wide range of engineering problems. KM Products Europe will be promoting its high-quality parts, known as KMP BRAND, for Diesel Engines, Construction Equipment, Mining Machines, Generator Sets and Agriculture Tractors, which are use by the majority of leading OEM’s. Morris Site Machinery is showing a wide line-up of brands, including SMC mobile lighting towers, ArcGen welders, Denyo generators, and Hilta power washer and pumps. The company supplies to a range of industries including hire, construction, rail and events and TV. MP Filtri UK is a specialist in hydraulic filtration and contamination monitoring technology – at Bauma the company will be showing its comprehensive range of innovative products that protects and enhances the performance of equipment; reduces service and maintenance costs; and lowers the risk of system failure. NC Engineering will be promoting its range of Site Dumpers; Dump Trailers; Low Loaders; Bucket Sweepers; Link-a-Sweeps; Commercial Drag Trailers; Commercial Dolly trailers and Commercial Step Trailers. An overseas construction exhibition would not be complete without the team from Off-Highway Research. Off-Highway Research is a management consultancy specialising in the research and analysis of international construction, and agricultural equipment markets. With a specialist team, the company offer a unique level of international research expertise to the construction, earthmoving, mining, industrial and agricultural equipment industries through researched reports and databases. Phoenix Engineering Co is the UK’s largest manufacturer of Bitumen Distributors, Chip Spreaders & Asphalt Hotboxes, which the company will be promoting to Bauma visitors. Rayco Wylie Systems provide monitoring systems for all categories of cranes. This year they will be exhibiting products from the current range including the new i4000 system as well as the i4500 and i4300 series of systems. Technical Services (UK) is a cooling system component specialist. The company supply cooling system components to OEM’s in On and Off-Highway markets which it will be promoting at bauma. Tyzack Machine Knives is the UK’s largest premier manufacturer of precision shear blades fitted to hydraulic demolition attachment shears. The company supply to major OEM’s within the sector. Webtec Products will be exhibiting hydraulic control valves, flow condition monitoring equipment and hydraulic diagnostic test equipment; this includes the latest in portable hydraulic data-loggers. Webtec’s test equipment products are used by service engineers worldwide to reduce machine downtime through preventative maintenance and rapid hydraulic fault-finding, as well as by R&D and production engineers to carry out development and pre-dispatch inspection tests quickly and accurately.